– The moving average measure, which smooths out the volatility, stood at 0.76, well above average (“zero” indicates average growth over the 1990-present period). Like last month, weak employment numbers weighted on the services sectors while all other sectors made neutral to positive contributions to the measure. – Manufacturing hours worked fell but other components continued to contribute positively; overall, the sector still benefits from strong demand. The civilian labor force component again weighed on the household sector, suggesting that firms will have an increasingly difficult time attracting new employees. 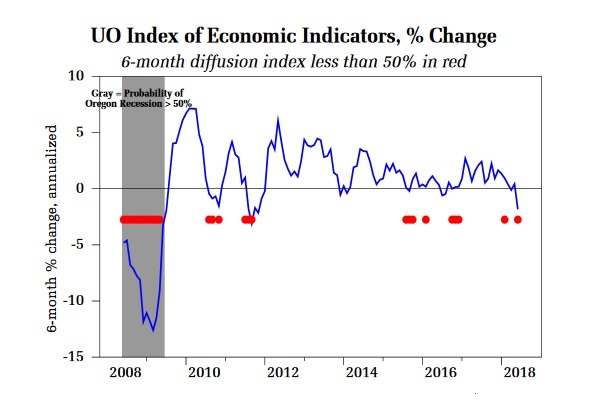 – The University of Oregon Index of Economic Indicators slipped 0.7 percent in June as a number of components worsened. Notably, building permits (smoothed) fell, extending the previous month’s decline as permits slipped to the lowest level since July of last year and added to evidence that new home construction is cooling, particularly in the multifamily market. – The number of initial unemployment rose, reversing a decline the previous month; claims continue to bounce around a historically low level consistent with further job growth. – New orders for capital goods and consumer sentiment (smoothed) both rose while the spread between long and short-term interest rates fell.